Egerton, who owns an identical Hyundai Accent WRC4 to Marcus. points in order to be champions. Only a win would do! bring the car home in one piece for Peter. We really owe him one! their efforts and sleepless nights over the weekend of the Bulldog Rally. we've been able to get the job done again!" The slightly shorter National Rally finished in dramatic style with defending Pirelli ANCRO National Gravel Champion Marcus Dodd leading for much of the day only to see his hopes of capitalising on the absence of current series leader Jon Ingram blown to pieces on the final 14-mile Givendale stage. 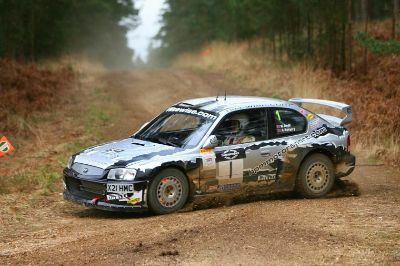 Poole businessman Dodd, outright winner of the Trackrod Rally in 1998 and 1999, pulled up agonisingly in Dalby forest when his Hyundai Accent WRC's engine failed, handing victory to Steve Perez, in a Ford Focus WRC, just days after the Chesterfield man returned from an equally successful fourth place on the Rally of Peru. 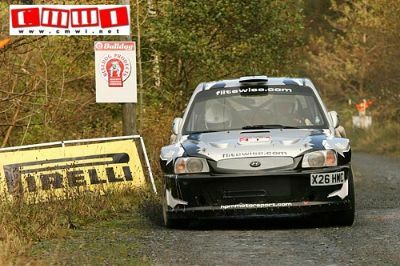 Aberdeen driver Dave Weston claimed the overall victory on today's Swansea Bay National Rally as Marcus Dodd took his second win of the season in the 2008 Pirelli MSA Gravel Rally Championship. 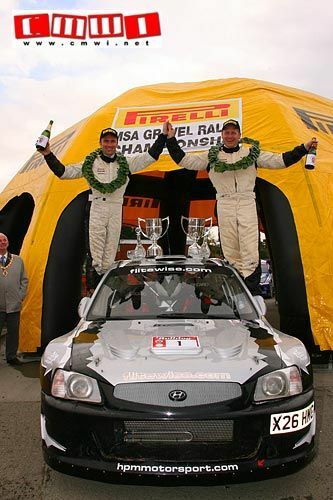 Weston and co-driver Aled Davies led from the outset in their Ford Focus WRC and never looked back as they finished 20 seconds ahead of the leading gravel series crew Dodd and co-driver Andrew Bargery in the Hyundai Accent WRC. Championship leaders Jon Ingram and Ian Allsop finished third overall and took second in the series in their Subaru Impreza WRC as Steve Perez and Stephen McAuley were fourth in their Focus WRC. Ingram still leads the title chase but with Dodd's victory, and the two dropped scores to be taken into account, it is still all to play for. "I'm pleased with the win but it's a shame someone didn't finish between Jon and I to keep the championship more open," Dodd said. "We had a push on stage five but we were a bit sensible on the last one." Dodd and Bargery took charge at the top of the championship leaderboard from Ingram/Allsop on stage four after Ingram drove through the test in road mode and lost a bit of time. Dodd had his fair share of problems too as a brake seal went on stage three, but it cost him little time. Marcus Dodd has won Rallye Sunseeker for the sixth time in his career – he and co-driver Andrew Bargery overcame clutch troubles on their Hyundai Accent WRC during the first leg of the event to move to the front of the field and, by the time they arrived back in Bournemouth, their winning margin was 43 seconds after over 62 miles of special stages. The win puts the pair into the lead of the Pirelli MSA Gravel Rally Championship after the opening round.